This weeks Simon Says Stamp Challenge: Transport It, provided me with the perfect oportunity to finally do a Star Trek layout. I love it, and hope you all will too. The background was fun. Black gesso mixed with DecoArt pearlizing medium at the base. Tim Holtz blue watercolor crayon was scribbled over it next and then washed out to provide just a hint of blue. Then white and blue soft body acrylic splattered over that. After that it was a mash up of stenciling with paste, cardboard cutouts, letters, embellishments and gems with some photos of the Starship Enterprise. Very cute night sky. Love the clocks too. 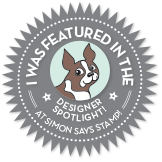 Thank you for Transporting It with us over Simon Says Stamp Monday Challenge!